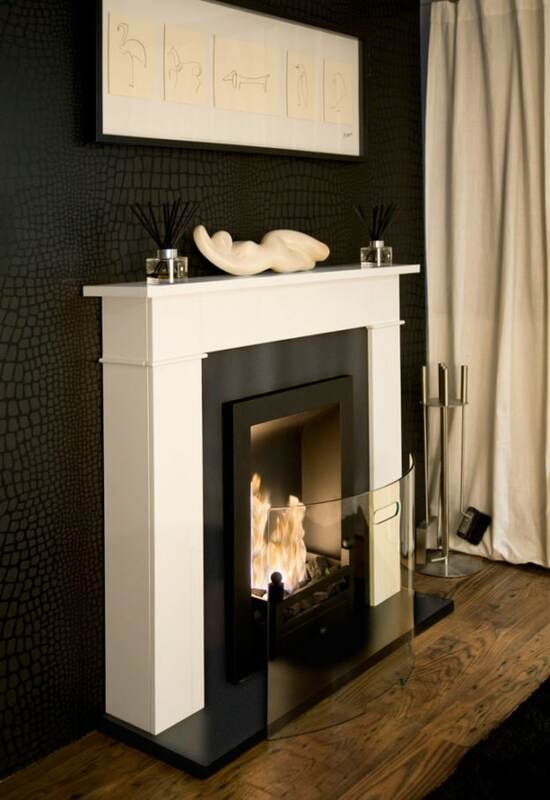 Due to central heating systems, a fireplace is no longer a necessity in most UK homes. Most houses and domestic buildings built in the later 20th and 21st century do not have the ventilation systems to service a traditional fire, as they simply don’t need them anymore. Nonetheless there is something romantic about a lit fire that still warms our hearts today, and fireplaces remain a popular feature in many homes, albeit for aesthetic purposes rather than as a requirement for warmth. Nothing says ‘welcome, relax and put your feet up’ like a fire. 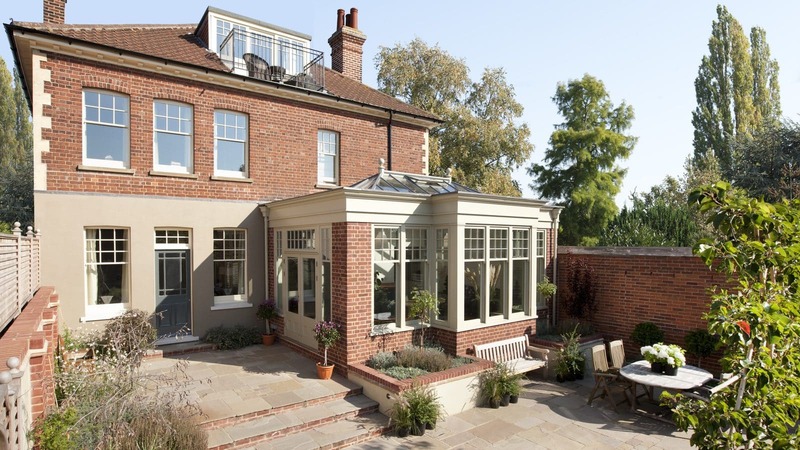 Glazed extensions should be designed to open out an existing room into a multi-functional space, and when such large spaces are created it can be useful to delineate zones with a purpose. For example, by adding a dining space at one end and a relaxation area at another, which work independently but still blend together. A fireplace is a great way to separate different areas in a larger room, helping to define how the space looks, feels and functions. 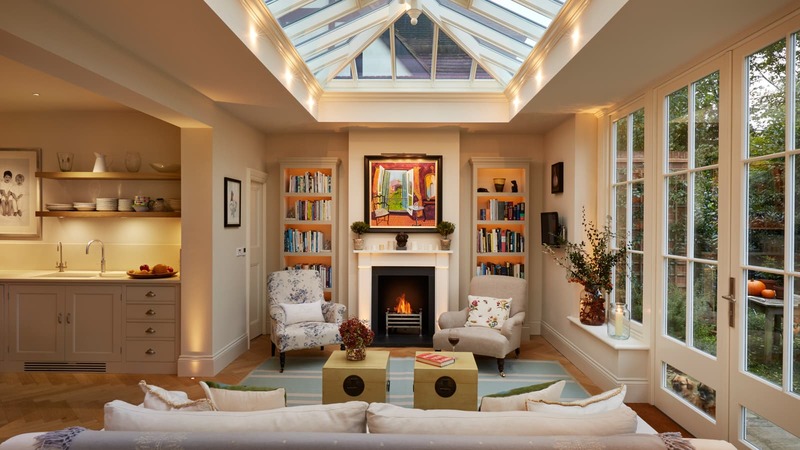 Fireplaces can be a great focal point in glazed extensions, as the dancing flames reflect off the glass windows, illuminating the space and creating a cosy environment in which to unwind. Gas fires have come a long way since the rather unsightly contraptions that first became available in the 1970s. There are now a wide range of modern, innovative designs on the market. While they may not hold the nostalgia of an open fireplace, gas-fuelled fire places are a far more convenient option and emit minimal emissions, so have a positive impact on the environment. One of the main benefits of a gas flame is the greater control it affords. Most gas fireplace models are equipped with remote controls, allowing you to create different ambiences by adjusting the temperature and size of the flame. While vented gas fires need a flue to direct fumes safely outside, there are several ventless gas fire models to choose from that don’t require ventilation. However, as all gas fireplaces run off the property’s main gas supply, they must be installed by a professional who can perform the official pressure tests required to ensure your fire meets sufficient building codes and specifications. Modern gas fireplaces offer enough of a design piece to make a minimalist, modern statement without getting lost in a large living space. 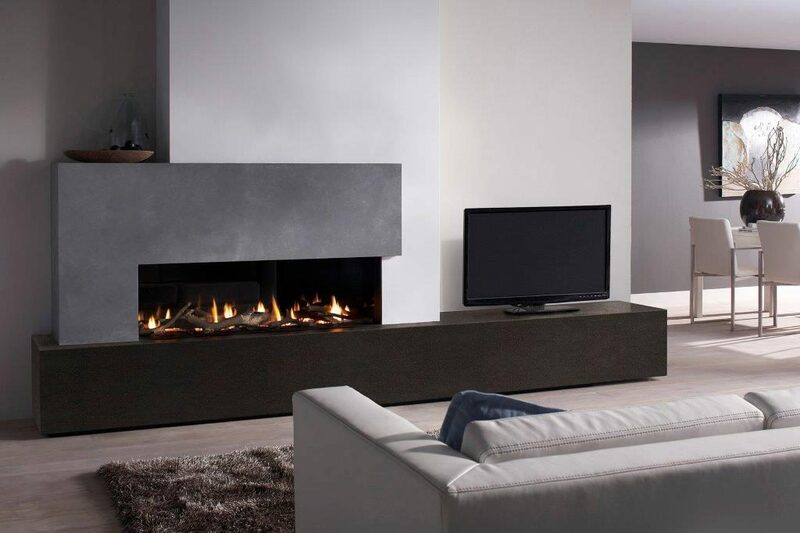 Out of all the modern fireplace designs on the market, wall mounted fires are one of the most convenient. 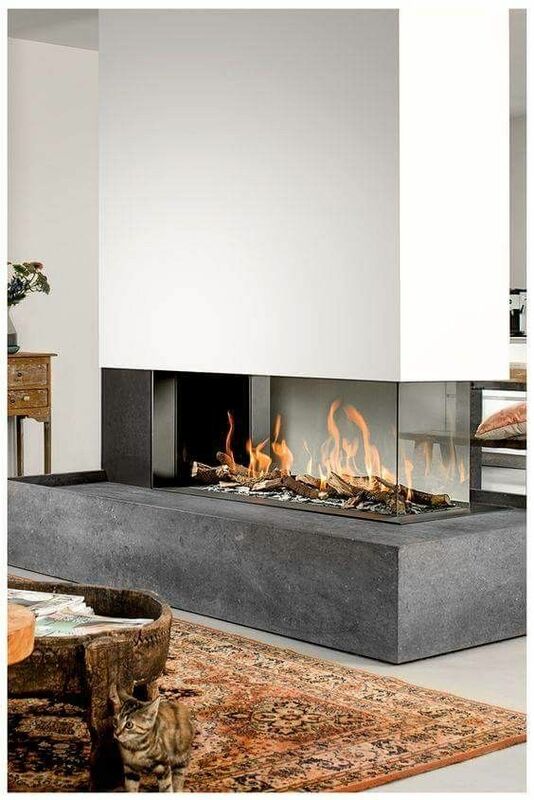 As they’re fuelled by electricity, this type of fireplace requires very little maintenance and can be placed on any flat wall in your home, maximising on floor space. For homeowners looking for an alternative to a television in their orangery, a wall mounted fireplace is the perfect focal point, not to mention one that provides an effective heat source. 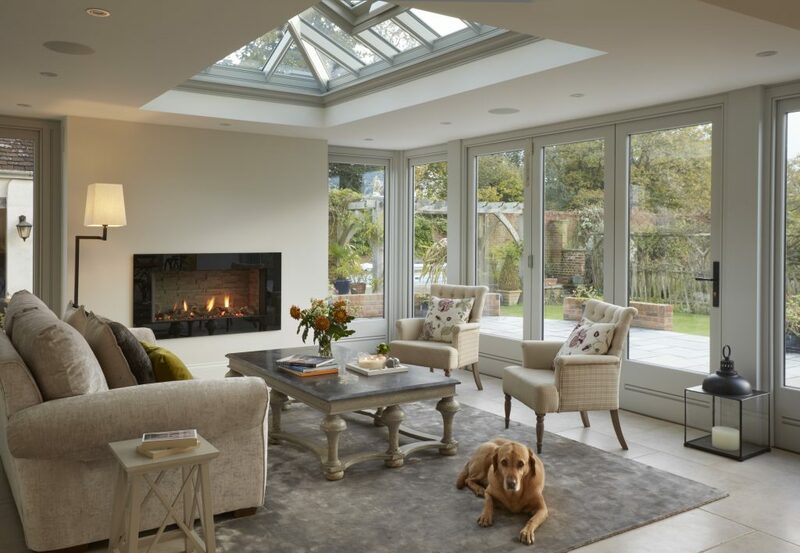 You can enjoy the ambience of a burning fire in your orangery no matter the weather outside – by increasing or decreasing the temperature of the heating function while keeping the flame, you can remove the additional heat source in warmer months. With no open flame or gas emissions, electric fireplaces are the safest option for homeowners with pets and small children. It also means you’ll never have to worry about stocking up on wood fuel, and since they don’t require a venting system, they are inexpensive to install and maintain. Bioethanol is a renewable, clean burning energy source made by fermenting the sugar and starch components of plant by-products using yeast – mainly sugarcane and crops, such as grain. With no nasty fumes or need for electricity, biofuel fireplaces are the ultimate guilt-free way to add charm to cosy evenings spent in your glazed extension. There are a range of striking designs available to suit all interiors: choose from contemporary fireplaces boasting clean lines and industrial materials such as metal and wood, or opt for a more traditional built-in fireplace design which allows you to enjoy the beauty of a living flame without the hassle of installing cumbersome ventilation systems. Back in August, we discussed how hanging baskets were a hot summer trend this year. 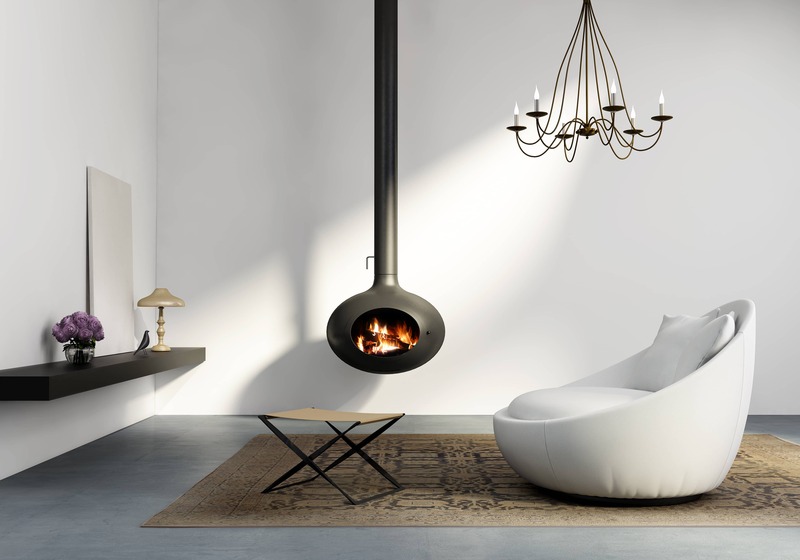 Now the nights are drawing in, we’re looking at how hanging fireplaces can bring a modern edge to your interior. This type of fireplace is suspended from the ceiling by a chimney or flue and is therefore usually wood-burning or gas-fuelled. Hanging fireplaces offer an almost futuristic look and make a stunning feature in any ultramodern living space, however they may not be suitable for everyone due to the need for suitable ventilation. Keep in mind that fireplaces which require a chimney or flue system have much more of an aesthetic purpose instead of being used as a secondary heat source, due to the considerable amount of warmth lost through the vent itself. Cleaner and more efficient than traditional open hearths, log burning stoves are a popular choice for homeowners seeking the authentic, smoky scent and quiet crackling of an open fire. This type of fireplace is a classic choice for homeowners who wish to complement other existing features within a period property. However, a log burner can also provide an elegant nod to yesteryear when installed in a more contemporary setting. 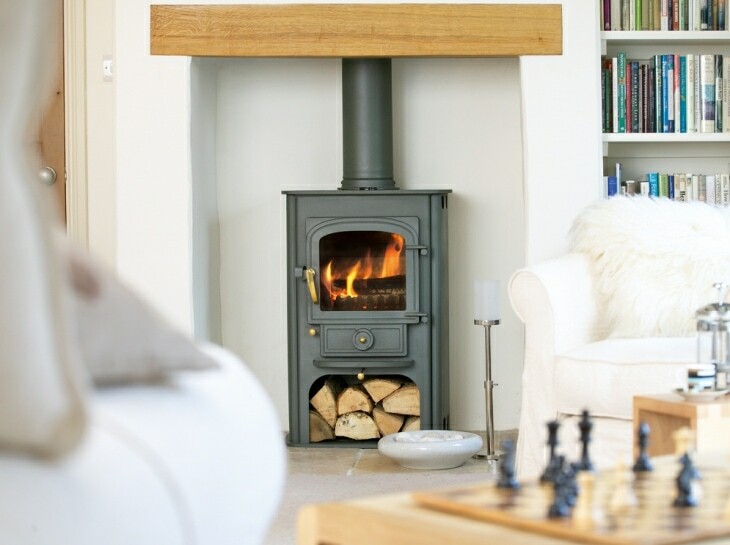 If you’re keen to install a wood burning stove in your home but the prospect of a high maintenance fireplace is giving you cold feet, there are now many suppliers who offer stoves powered by smokeless fuels, so you can enjoy the rustic appearance of a traditional log burners without the ongoing upkeep. Who says fire pits are just for outdoors? Aside from being architecturally impressive, double-sided fireplaces are a beautiful way of breaking up a large, open-plan space into zonal areas. Their transparent casing creates a ‘fire pit’ illusion which lends itself particularly well to rooms designed for entertaining; divide a large, open extension into a dining space and separate seating area in which to relax for after dinner drinks, all connected by the same stunning fireplace. 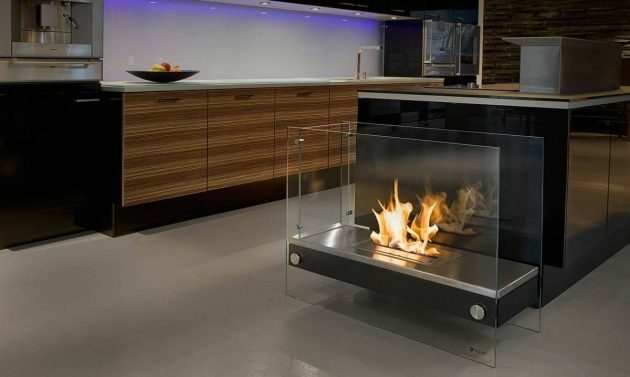 As you can see, there are a variety of modern fireplace designs to explore. 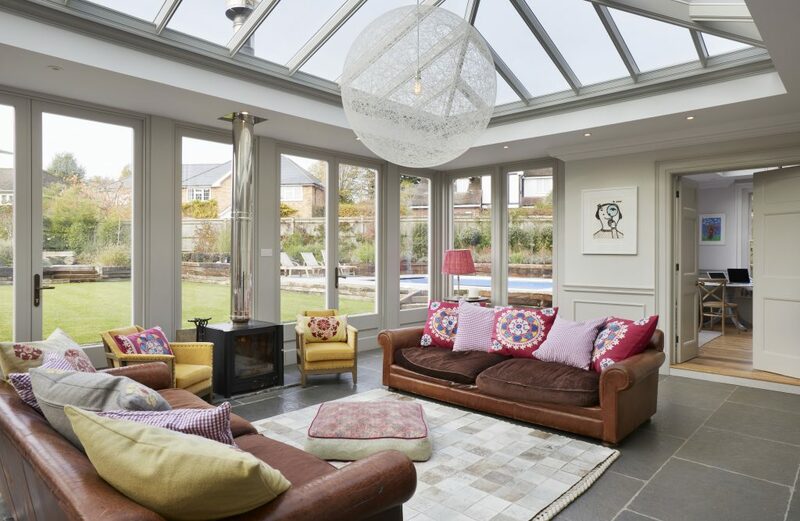 If you’re thinking about including a fireplace feature in your glazed extension project or want to add one to your existing home, it is important to discuss your ideas with a designer at the very outset of a project. That way they can advise you on the best options to suit your lifestyle, ensuring any construction work meets regulations and the necessary ventilation is accounted for. 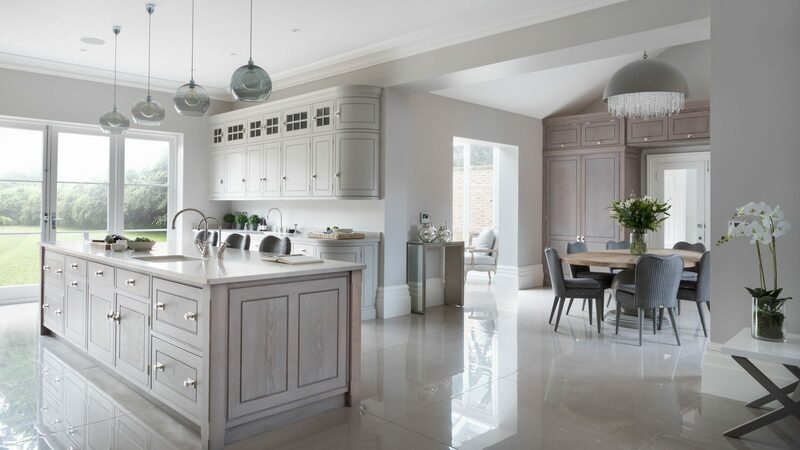 We regularly invite design and interiors experts to write for our blog. 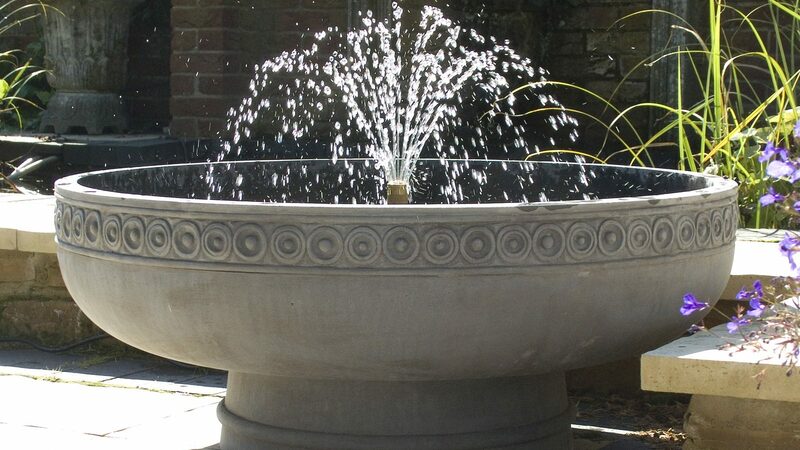 Here, Haddonstone offer some expert advice on choosing a water feature for your garden.